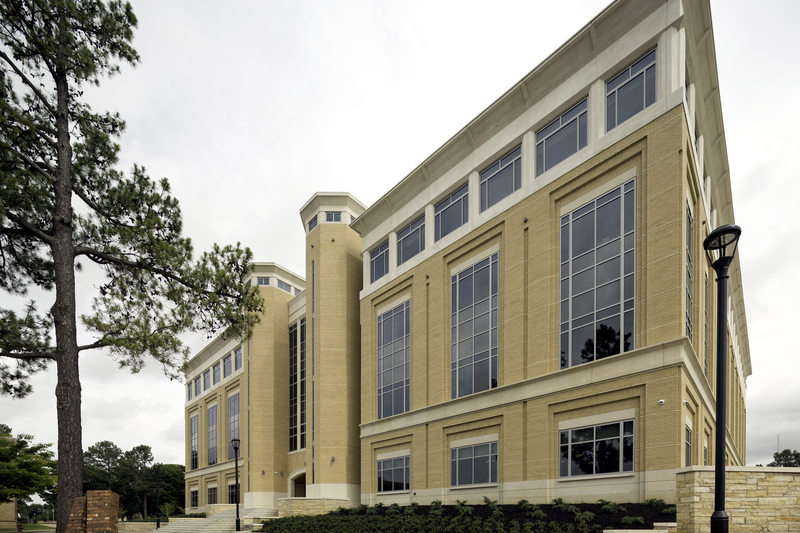 Arkansas State University’s Humanities and Social Sciences building will greet its first students in the upcoming 2015-16 academic year. AMR Architects designed the building’s exterior to complement the campus’ historic architecture and its modern interior to offer quiet, comfortable learning spaces. Helping accomplish these goals, the new building features ROCKFON’s ceilings systems throughout its 120,000-square-foot, four-story facility. The HSS building serves as a centerpiece linking Historic Mall to the west, the Caraway Mall to the south, and the new Campus Commons to the north. The structure dramatically defines the edges of multiple plazas and vistas. Inside, it encompasses more than 40 classrooms, laboratories, seminar rooms and approximately 140 faculty offices plus a large atrium for groups to gather. HSS will have 24 percent more space than offered by the building it replaces, Wilson Hall. Arkansas State University’s oldest building opening in 1932, Wilson Hall eventually will be adapted and renovated for other uses. 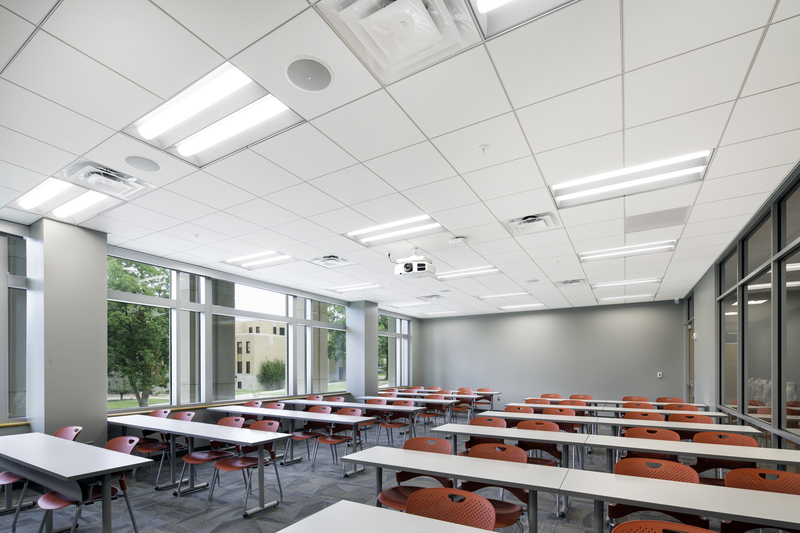 Considered one of the largest instructional buildings on a university campus in the state of Arkansas, HSS has been constructed in four phases with an estimated budget of $36 million. The final phase was substantially completed in June 2015. This phase focused on the interior and site exterior and was completed in 16 months with Tate General Contractors. Tate worked with AMR on all four phases of the project. AMR also received architectural support from CahoonSteiling | Studio of Jonesboro, Arkansas. In total, AMR Architects was involved for more than 10 years on the project. The initial design was bid in 2003 and shelved due to budget constraints. With financial support from the governor and state legislature, the project first broke ground in Sept. 2008. 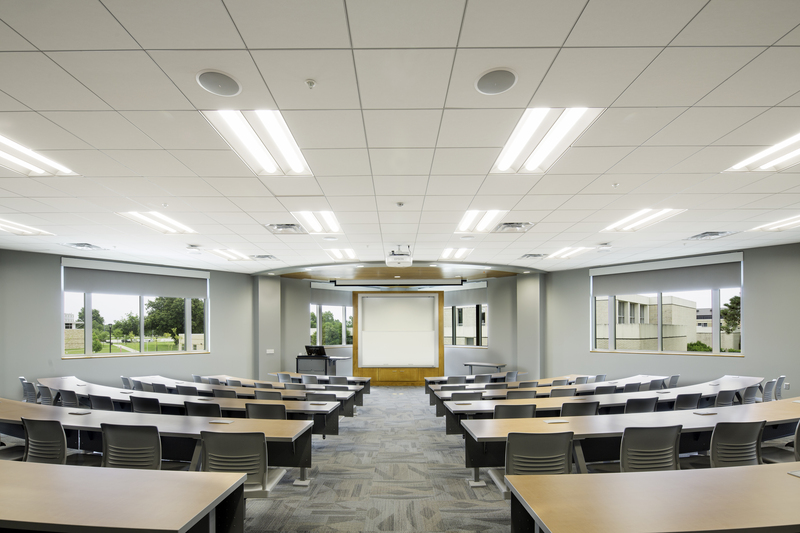 During the continued phased construction, the university incorporated some modifications as classroom count and size changed dramatically. Budgets remained top-of-mind in continuing from one phase to the next. AMR Architects employed value engineering methodologies to ensure the construction and materials maintained the project’s performance and aesthetic requirements, as well as provided the most cost-effective selections. In early 2014, as the fourth phase began, AMR Architects’ Jamie Borg, associate AIA, reviewed value-engineered options for the ceiling systems selections. 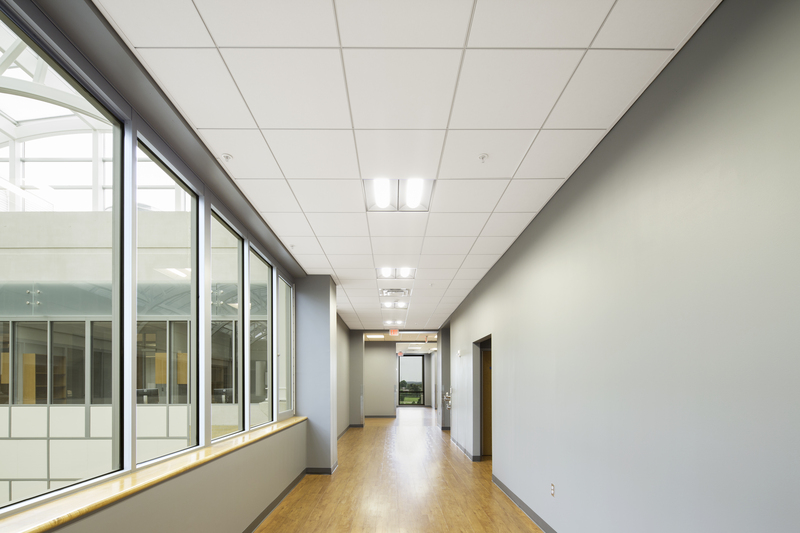 The existing specifications called for an acoustic ceiling tile with a white finish that met the requirements for Seismic Design Categories D, E and F and the high Noise Reduction Coefficient (NRC) of 0.70. “Academic buildings often equal noisy occupants. In campus-based offices, acoustic specifications typically are set to ensure privacy and a quiet work environment,” explains Borg. Curtis Construction, LLC installed ROCKFON Tropic 1020 stone wool acoustic ceiling into Chicago Metallic 4500 Ultraline™ heavy-duty bolt-slot suspension system. The 2-by-2-foot ceiling panels feature a square tegular narrow edge and shadow molding along the perimeter to create the desired aesthetic. ROCKFON stone wool ceiling panels are primarily made from abundantly available basalt rock and contain up to 42 percent recycled materials. These stone wool panels are inherently anti-microbial and sound absorbing, without needing to add treatments or associated costs. They also provide high light reflectance (LR 0.86) and UL® Environment’s GREENGUARD Gold Certification for low-emitting products. The Ultraline suspension system further contributes to the ceiling systems anti-microbial performance and sustainable goals, in addition to being ICC-ES listed for seismic suspended ceiling applications. 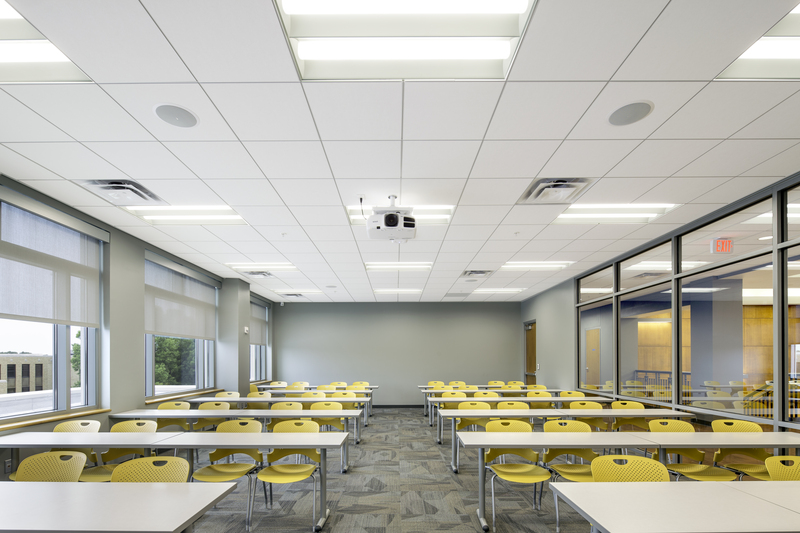 Providing low maintenance and long-term durability, these ROCKFON products supplied in North America are supported with a 30-year product warranty on the stone wool ceiling panels and a 40-year on the suspension system.